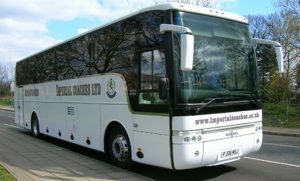 Whether you need a vehicle for a family celebration, corporate event or even a sports club outing, Imperial Coaches can supply a vehicle to suit your needs. We have vehicles of every size, from 33-seater minibuses to double-decker coaches. You can rely on us to provide the perfect transport for your needs. Day trips – seaside’s, museums, historical land marks etc. Fantastic service, could not fault it at all!! I used this company for airport transfers for my hen do. The man that drove the mini bus was polite, on time and didn’t mind the girly banter! I would thoroughly recommend them! Imperial have always been very reliable and helpful and if we have had any problems that have sorted them out for us quickly and with no fuss. Always on time and able to accommodate unforeseen changes that may occur. Coaches are always clean and tidy and the drivers are very friendly. Excellent service and the online booking is easy to follow. would definitely recommend this company. Very reliable at any time. Always take full responsibility for customer. Thank you Imperial!! Have been using Imperial Coaches for a few years now. We mainly book them for our Christmas party (taking staff to/from London). Always been helpful during the booking process and on time on the day. Good service overall and have recommended. 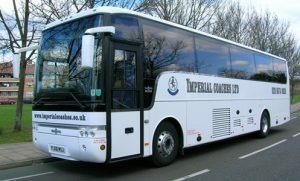 Always a good level of service, no problems encountered over the years we have been using the company, as a school we have booked Imperial for many Educational Visits and always felt happy with the service.